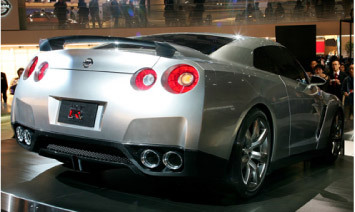 The highlight of the 39th Tokyo Motor Show is the announcement of the Nissan GT-R Prototype. 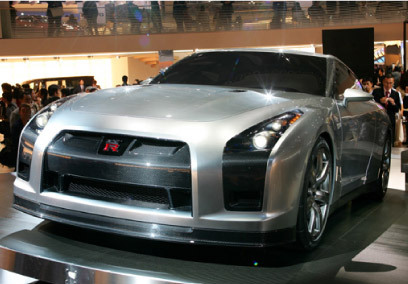 The next well rumored GTR has finally taken shape and we got the inside scoop on the details. Here is the best 5 vehicle that we selected, and the special report from the 2005 Tokyo Motor Show! Finally, Nissan premiers the beast! The prospected release is 2007?! Nowadays, we hardly see any turbocharged vehicles on the automobile market. The new GT-R Proto finally unveils itself to cure the bored market! This GT-R was released with a revolutionary design that keeps up with the era. Rather than labeling this car as Nissan's top grade vehicle, the design focuses on its potential for speed. Since Carlos Ghosn, the President & CEO of Nissan Motor Co. Ltd, announced that GT-R will hit the market in 2007, with this final design directed for the production model. Carbon fiber components on the side skirts and the rear under spoiler are prospected to be featured on the production model. Unfortunately, no information about the engine and the drivetrain was released. But the left and right hood vents, quad tipped muffler may indicate that the engine will be a V configuration. This setup will surely be mated with a twin turbo setup. It's also disappointing not to see a wide mouthed opening for a front mount intercooler, but the intense design of the entire vehicle makes up for this. Another factor that we were wondering about was the drivetrain. Was Nissan going to incorporate the 4WD Atesa system? On this prototype model, the tire sizes differed on the front and rear, possibly indicating that this may be an FR setup. It is still a mystery whether the GT-R will be 2WD or 4WD, but anything is possible at this stage. Our hypothesis is that the GT-R cannot give up its image by becoming 2WD. Its deep performance supported by an all wheel drive system must live on. An aluminum core can be seen through the front grill. Can this be a core for an intercooler? Or a radiator? Or even an A/C condenser? We hope that it's a huge intercooler lies under there. On a BNR34, the rear carbon fiber diffuser becomes 1 piece with the rear under panel for a full flat system. If they use this idea again for the next GT-R, it will be very interesting. Tire: Front 255/40-20, Rear 285/35-20, Potenza RE070. The early models (R32, R33, R34), with the Attesa 4WD system have the same size tires all around. Can this be a hint of the new drive train configuration? 4 huge muffler tips can be seen from the rear. The new trend these days is to have a muffler tip extend out of the rear bumper instead of from under. Looking at the design, it seems easy to exchange the exhaust system. The new GT-R will sport a wide diameter piping throughout its system. Finally, a Japanese sports car with a V10 setup! The Lexus LF-A was designed with inspiration and many feedback from F1 technology. Toyota rarely utilizes the word "sports" in their vehicles but when they do, they mean pure business. There wasn't much information about the monstrous V10 engine, except for that it was incorporated from F1 technology. The displacement is expected to surpass 5.0 liters and produce over 500 horsepower. The vehicle was never intended for a mid ship configuration because then it will become off balance. The motor lies in the front of the car for an FR layout, or even possibly 4WD, even though the vehicle looks like a mid ship vehicle. The radiator and the entire cooling system were placed in the rear. 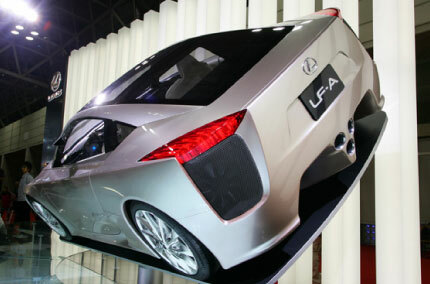 Because of this, the LF-A lacks a front air duct benefiting overall the smooth exterior design. The LF-A is not entirely wide, but rather compact. The potential to be one of the top exotic cars of the world can be seen. The underpanel is a full flat layout, accompanied with a racy center exit exhaust system. The reason why there are 3 tips is still a mystery, but we can't wait to hear the sound it will produce. The V10 engine looks like it came straight off of an F1 machine. The 10 individual throttle bodies and the equal length exhaust manifold display the seriousness of the engineering. The twin disk clutch was also installed, not shown in the photo. Although this vehicle is from Lexus, a luxury oriented manufacturer; it sports a carbon fiber steering wheel and interior panels. The seats are made of pure leather, and a sequential transmission is to be rumored as well. 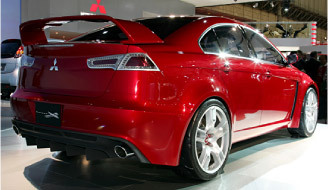 be the next generation Lancer Evolution?? With its characteristics adopted from the nimble Lancer Evolution, the Concept-X is expected to be a very quick street vehicle. The S-AWC system, which is the improved Super AYC (active yaw control) + ACD (active center differential) is featured on this machine. The system integrates the brakes, acceleration, suspension, steering, engine, and transmission to the 4WD system. The safety and the controls are further improved upon on this new system. An auto-manual 6 speed transmission along with Brembo 6 pot calipers are just a few features that enable any average joe to go fast. Aluminum body panels and 20" wheels accentuate the exterior styling of this ride. 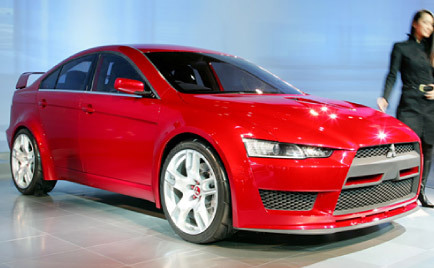 This Concept 10, expected to be the 10th Lancer, has a new structured aluminum block engine. The specifications are still unknown, but the intercooled MIVEC setup is planned to live on. It can be said that this motor will be a lightened more powerful 4G63 engine. Although the Evolution 9 had just been released, this car is expected to blow the doors off its pre-released cars. The black and aluminum trim interior is left simple and functional for the driver to concentrate on the road. Also, a six-speed auto-manual transmission with paddle shifters is a remarkable feature that is included. The whole vehicle is designed to promote a sporty feeling. Like the front, the back seats are full bucket as well. The monitors behind the front headrest shares vital information with the rear passengers. The enormous brake rotors fill up the 20" rim space easily. The giant Brembo 6 pot calipers proudly carries the Lancer Evolution name to its 10th form. Quite possibly the Silvia's successor?? 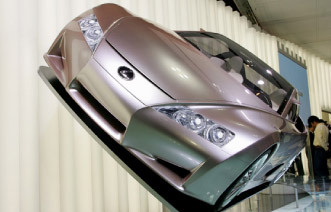 This compact coupe, Nissan Foria, is based on the elegant features of the 1st generation Nissan Silvia. Lacking the B pillars, the suicide doors reminds us of the RX-8 design. This vehicle has a FR layout. The LF-SH is the next generation of the Celsior. The car will be released to the market with this simple, yet effective style. It is rumored that this car will be powered by a 4.3-5.0 liter hybrid electric engine. The interior is decorated with LEDs, illuminations, a sound system, and acrylic paneling. The fully customized bB is like being at the Tokyo Auto Salon. Another big highlight is the Honda SH-4WD system in this Sports4, which distributes torque between the front and rear from 70-30 or 30-70 and also splits the power delivery between the left rear and right rear from 100-0 to 0-100. This feature provides a high level of vehicle control. This vehicle powertrain is located inside each rim all around, and greatly reduces the power loss through the drivetrain. Because this vehicle does not require an engine, transmission, or differential, the weight distribution layout can be flexible by placing the battery in various locations. The future is the hybrid rotary engine! Mazda Senku combines an Electric Engine with the rotary to produce torque at the lower RPM range while maintaining great gas mileage with high performance. This is the new rotary technology! This machine features a hydrogen powered rotary engine that works in conjunction with traditional gasoline. Offering a dual-fuel system, the car will run on both gasoline and hydrogen. This setup is the next generation of rotary engines. Equipped with a clean running rotary! Mazda Premacy is a pure hydrogen powered rotary engine, and the first ever FF Mazda. There is plenty of torque even at the lower rpm range. The Wankel engine's weak points of emissions and bad gas mileage was completely eliminated. The little monster with a 1.5 liter engine! The Daihatsu Copen is equipped with a 1.5L engine in the lightweight body. The dimensions are pretty wide and was designed to be as intense as the new Z33. This vehicle only weighs in at 880kg (1900lbs). It also is equipped with Brembo brakes all around. The HVS is a FF machine with an electric front and rear motored 4WD hybrid machine. The torque produced is that of a 2000cc+ engine. LC is a small size car that fits 2 full size adults. The exterior is a retro design and the red checkered interior is fancy and cute. This car is perfect for shopping around town. An Orochi with Lambo Doors! The convertible concept model features lambo doors. The brilliant white paint creates a strong impact in its design. This is the new style of the Orochi line.